My son was recently doing a project for school on “Victorian Housing”. They were asked to look at remaining Victorian houses in their area and describe them. This made me realise how distorting this was – because what remains of Victorian housing is middle and upper class. The working class slums have been knocked down. I was born in a real working class, privately rented, house in Dover in 1952. It makes the ‘Monty Python’ sketch about “I was so poor that…” look all too real. We had no internal toilet or bath. The toilet was in a little hut at the top of the sloping garden – absolutely freezing in winter and full of spiders. The bath was a tin one my Mum had to fill in the kitchen for us, with water off the coal fired range. Th main thing I recall is how cold and damp it always was. We had fireplaces in every room but could not afford to have them going. I guess the walls were not cavity ones, so the house leaked heat like a sieve. we used an oil fired stove in the living room, which several times burst in columns of fire. Amazing the place never burnt down really. Below are the drawings I did for my son. The layout of the house was bizarre – with central staircases between each floor that opened into both rooms on the floor (see right hand inset). This made for great games of hide and seek between me and my older sister, but was crazy in terms of wasted living space. The ground floor had a kitchen at the rear, opening onto the ‘garden’. I don’t remember what was in the front room, but think it might have been a cellar/coal store. 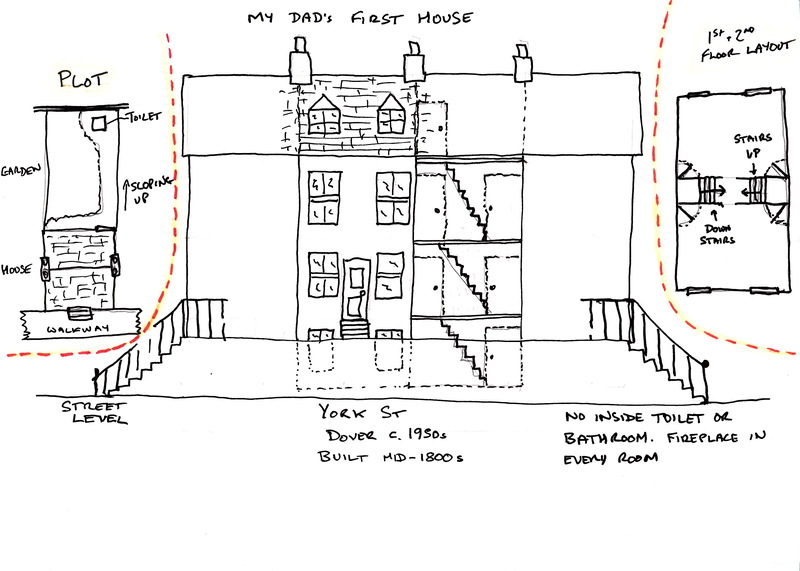 The first floor was a living room at the front and my sisters bedroom at the back (I think). The second floor was my parents room at the front and my room at the back. The third floor in the attic space was so cold and cramped it was just used for storage. I have tried to find pictures of the houses, which were demolished to make way for a dual-carriage way sometime in the 70s I think. The best I can do are below. This picture of York St in the 1950s just shows the railings leading up to our ‘walkway’ on the far left. 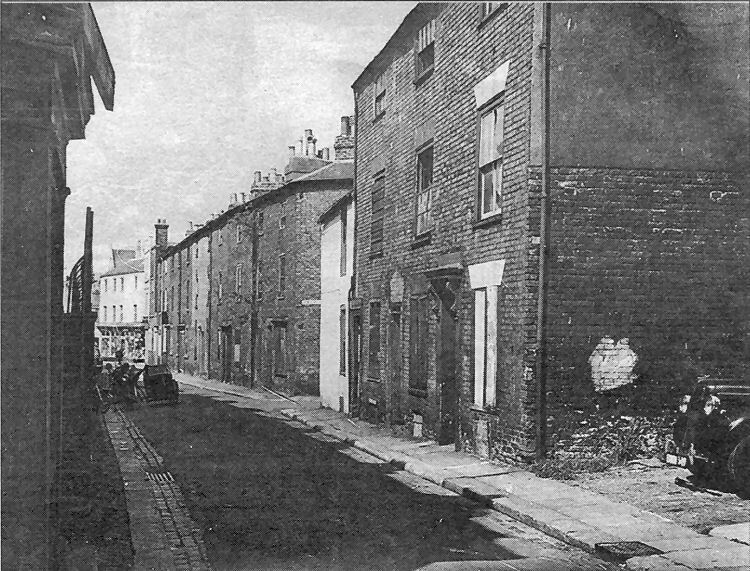 The white painted building on the right is a corner shop we used. The picture below (not anyone I know) just about shows the walkway and our block in the background on the left, although it isn’t very clear. 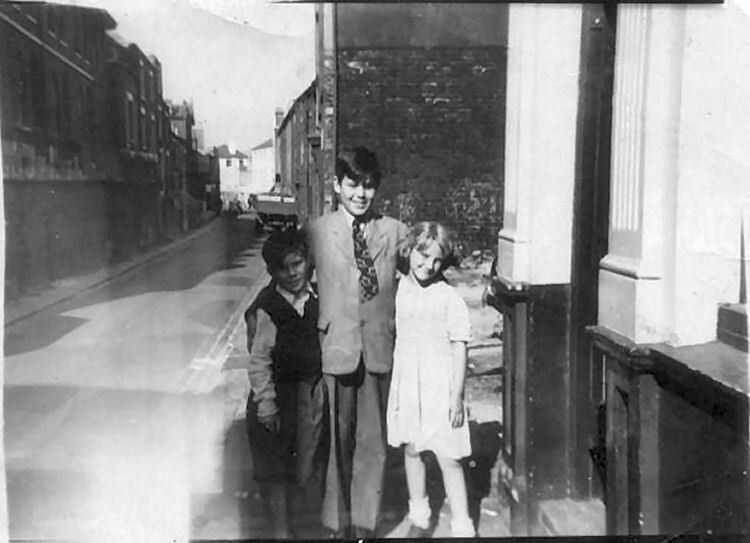 When my younger brother Gary was born in 1960 we got a council house up on Astor Avenue. More about that and my childhood in Dover later. In the meantime, if anyone has further information about York St Dover in this period I’d be grateful – it is more than half a century ago so I am not sure how accurate my memories are!